“There is no excuse for a few individuals acting in way that is a national disgrace"
The Prime Minister, Hon. Peter O’Neill CMG MP, has demonstrated the importance of meeting a challenge head-on when he visited Mendi, in Southern Highlands Province today. 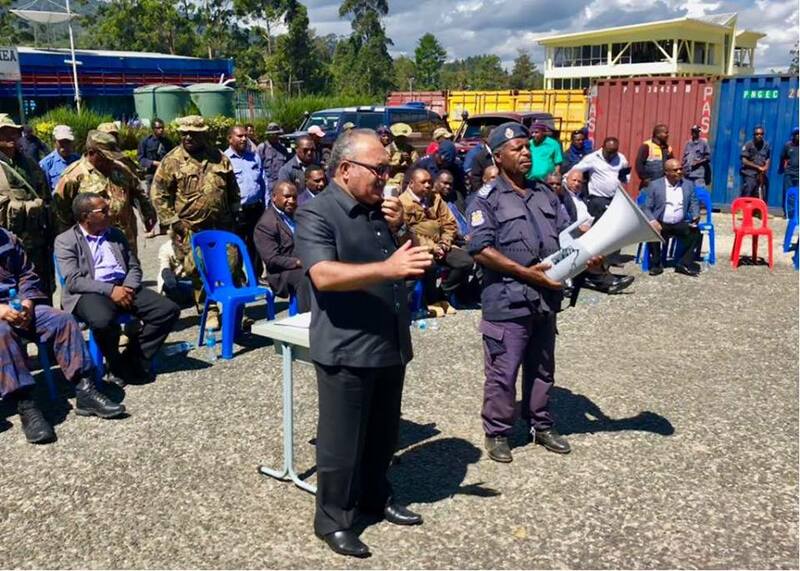 After several days of unrest in Mendi town, followed by the Prime Minister working with parties to restore calm, it was important that he speak directly with the people. The Prime Minister called on all people in the Southern Highlands Province to show respect for the law. “There is no excuse for a few individuals acting in way that is a national disgrace. “We cannot change what happened, but we can all take charge of the future. PM O’Neill said the people of the Southern Highlands have raised concerns with him and these will be properly followed up. “I have listened to the concerns relating the Electoral Commissioner in regards to the conduct of the election for the Southern Highlands Regional seat. The crowd of around 5,000 was calm and relatively relaxed considering the past week’s tension, and all the leaders who spoke welcomed the presence of the Prime Minister.